Oxford Gene Technology (OGT) have launched a new range of arrays at the European Society of Human Genetics (ESHG) Conference in Glasgow, UK, that are dedicated to elucidating the underlying causes of developmental delay. OGT’s unique Cytosure™ Constitutional v3 arrays have been developed following its recent licence agreement with the Wellcome Trust Sanger Institute to access the Deciphering Developmental Disorders (DDD) study data — which successfully identified new areas of the genome responsible for developmental disorders.1, 2 OGT has used this data, together with the latest updates from ClinGen*, to deliver the most advanced, high-resolution developmental disorder arrays currently available. OGT has optimised the arrays via a proprietary probe design algorithm and experimental validation, enabling the selection of highly-targeted, specific probes throughout the genome. Using an informed, sophisticated approach to array design, more of these optimised probes have been placed in regions of the genome that are most likely to detect a biologically relevant aberration. The result of this careful design procedure means that regions with the highest priority are covered at exon-level resolution on the arrays, enabling single-exon CNV detection in up to 502 prioritised genes of interest. James Clough, Executive Vice President Commercial at OGT commented, “Through combining our superior array design capabilities with the latest research-led gene content, we are proud to offer our customers the most advanced array design available for accurately and easily identifying the causal aberrations underlying developmental delay. These new products underline OGT’s long-standing commitment to providing cytogenetics researchers with the latest tools to further understand developmental disorders”. 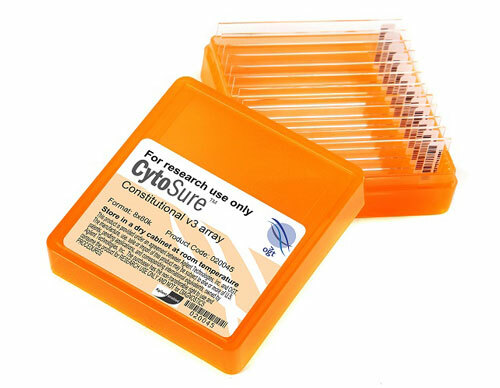 Providing straightforward analysis, all CytoSure arrays come with OGT’s renowned Cytosure Interpret Software and full on-site training, streamlining data analysis and interpretation. Innovative features enable the automation of data analysis workflows, minimising user intervention and maximising both consistency and speed of interpretation. Find out more about the most advanced arrays for identifying developmental disorders at www.ogt.com.